From our first view of the front facade, we can see the architect has taken time to create something that is both memorable and stylish. 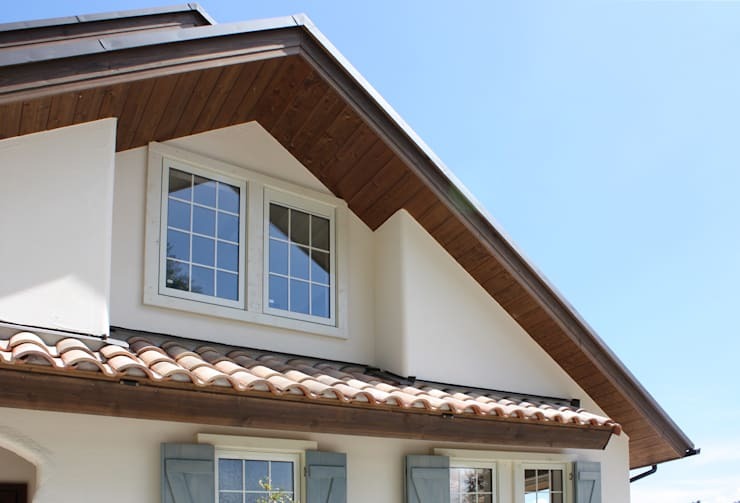 We can make out the triangular peaks of the top and mid-level roofs, with a horizontal awning below under the central windows. This house stands firm, balanced in symmetry and design. There are many wonderful decorations such as the teal window shutters and blocks of wood which add a more rustic feel. The beautiful dark wood front door, tiny garden and picnic bench are little details that show care and time has been given to this project. For those who have a country property or would like to bring some country features to their own home, windows like these definitely add a certain homeliness to a building. Above the windows, we see wooden panelling, while below there are old-fashioned red tiles, giving a certain Spanish feel to the structure. If you're inspired to update your own abode in this style, homify's professional tilers can help. There has been much taken from France and Spain in this property's design. Notice the archway above the porch which is formed as part of the outer wall. The windows with very French-looking shutters are a lovely feature the benefit the overall style. We love the tiny garden area and old rectangular logs. This really is something so simple to create, and yet so authentic. Continuing the traditional European theme, we have a heavy, oak door with black iron handle and latches. We get a close look at the porch and entryway and also the outdoor light, almost camouflaged against the white walls. Other nice features include the curling latches on the window shutters and wooden ceiling of the porch. Inside, we're greeted with a rustic, simple and white aesthetic. 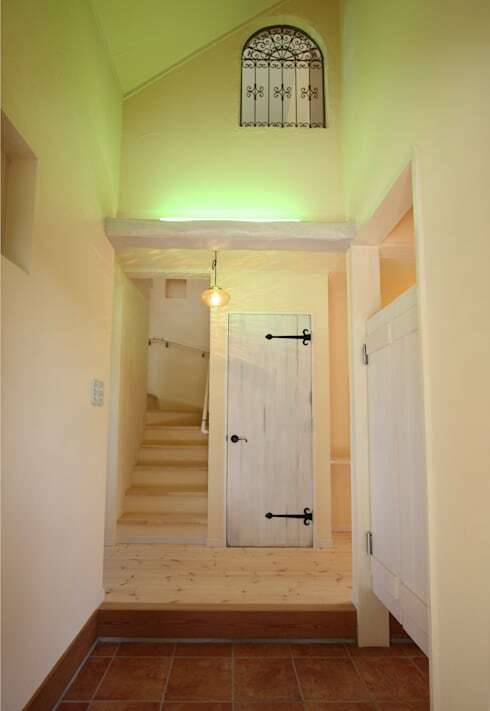 From the farmhouse wooden doors to the painted beams and narrow stairway, everything here is in keeping with the old country vibe. 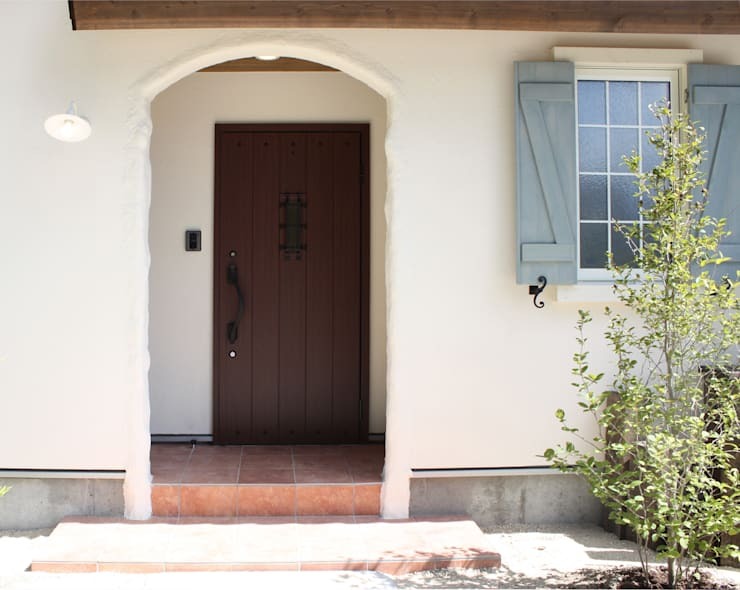 The half-sized door on the right is very reminiscent of the types of doors used in old rural Spain. The beautiful patterned window railing at the top of the picture is striking, too. 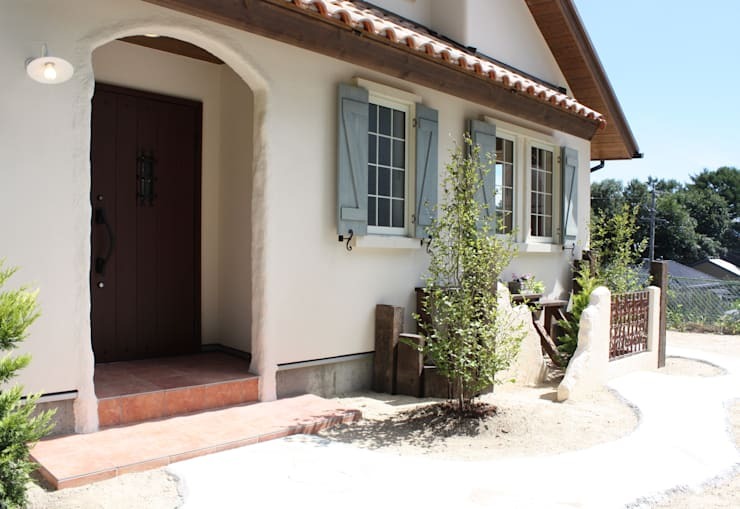 Yes, even in this very European-style home, there are nods to traditional Japanese culture. 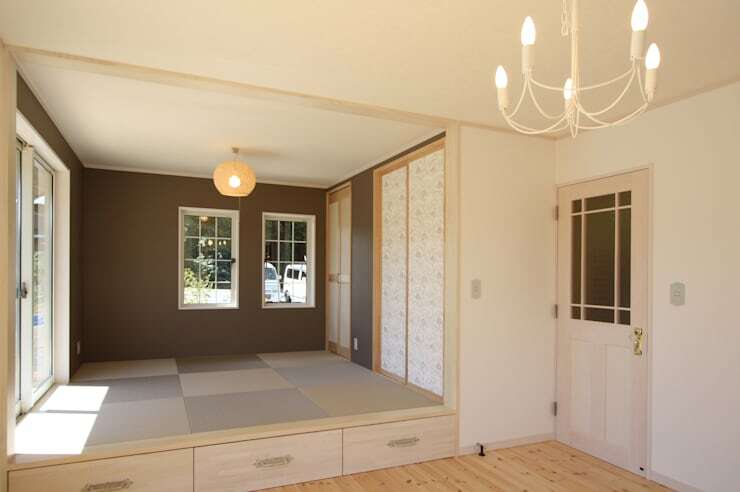 This sliding door, tatami mat room has a pleasing blend of the old and the new. Notice the hidden drawer storage, which facilitates sleek and practical living. This basic, minimalist kitchen is bright and pleasing to the eye. Outside we see beautiful views of the countryside and can almost feel the refreshing breeze as it blows through the house. 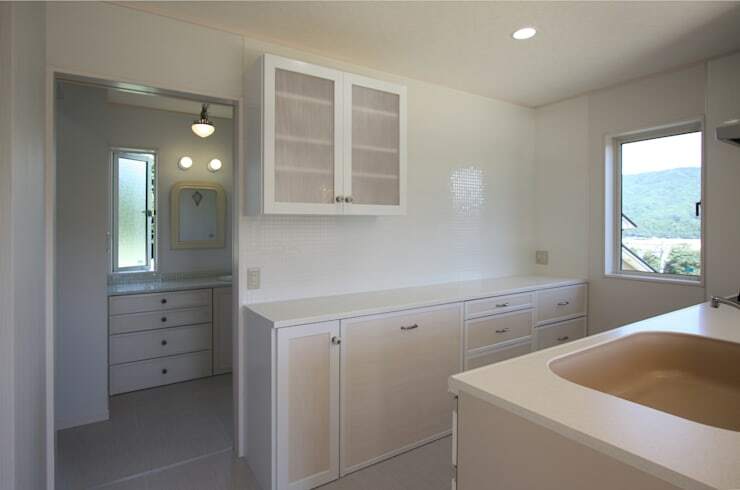 The sink unit is modern, as are the units opposite. Spot lighting has been selected for effective and practical illumination. 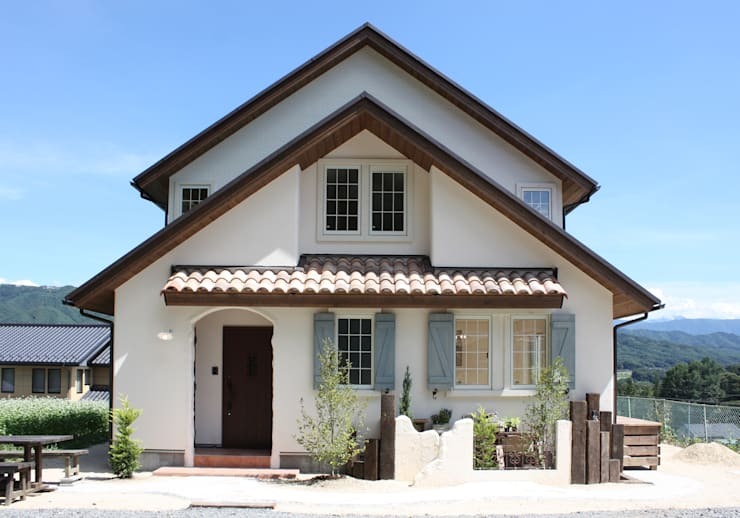 Were you surprised by this Japanese home's style?